I kept steaming up the lens. Yes, yes, I know, I could’ve called it Royal Milk Rooibos but then it’d sound as if I’d made something called Royal Milk. Yeah, tisane, red tea is a tisane…hah! You know, Dear Reader, I’m almost certain I made this years and years ago with tea bags. Here I am, more experienced and in possession of loose tea. I honestly bought the loose tea for the composters, but they had a fine filter that didn’t taste of metal and honeybush, which I could’ve used, but I wanted the more intense rooibos, so I’m having the occasional cup of loose tea and this popped into my head. If you want a better breakdown of milk tea hit up the link (Original here) I’m just trying it out as a one off, I take my tea plain, hence the lack of any sweetener recommendations below. I didn’t even make any cookies to have with it, mostly because they’re work and I’m lazy. You can naturally use any tea here, but the reason rooibos works is that it’s more like black tea than herb teas. If you’ve never gone through the trio of rooibos, red, green and honeybush, there is a wild, but I didn’t find much difference between that and red, then you really should consider giving them a try. The reason I drink it is that it was a replacement for caffeinated teas and teas laden with sugar and milk, usually taken to eat an entire pack of biscuits because of the intense pain I mistook for hunger back in the fat-days, over time I’ve grown to love the taste. Now, the milky tea drinkers are the aberrations in my mind. I don’t do well with too much caffeine so I stick to these teas. 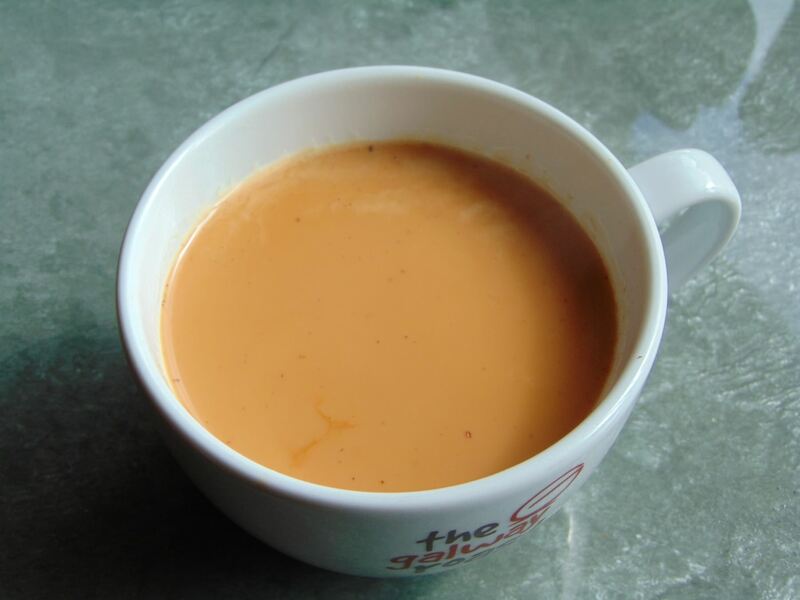 This is simply a milky cup of tea, instead of adding milk cold you heat it gently, the tea is also brewed very strong. You’d be surprised when using loose tea how even the mildest of tea can be brewed to strongly. I may, just may, have brewed an intense cup of honeybush and almost choked on the taste. Honeybush seems artificial, Dear Reader, there’s an intense aroma and a mild taste, too mild for something with this much milk, but worth mentioning to any red tea neophytes. Loose tea has this grand feel to it, as if you were somehow elevated by drinking your leaf steepings with bit floating in it. I like the fact I can adjust the taste of the teas, that’s not a bad trade off for the messiness loose tea entails. The worms, still slowly doing something, probably, will reap the rewards. All things go back to the soil, Dear Reader, I’m just trying to make the best use of them that I can. 1. 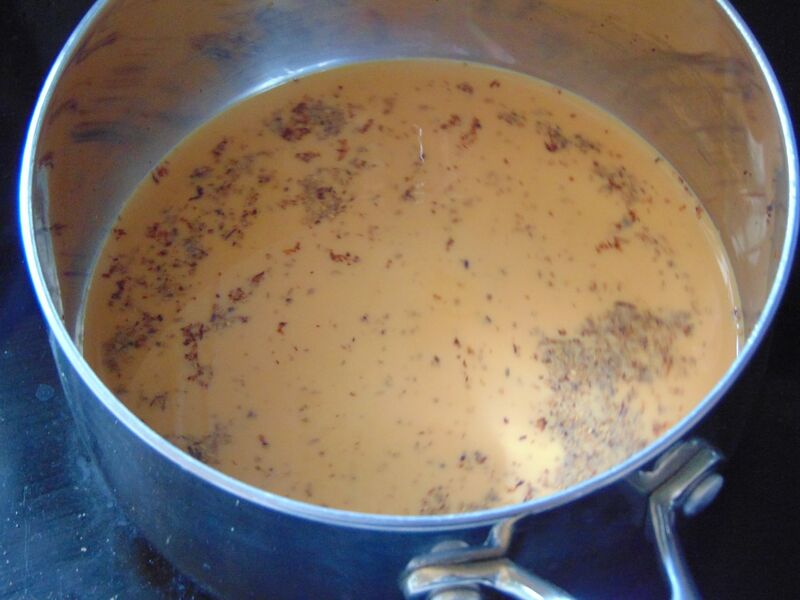 Add Water to a pot and bring to a boil, add the Rooibos and reduce to a simmer. Let cook for 2 minutes. 2. Add Milk to the pot and slowly bring to boil. Once a boil has been reach remove from heat and strain into mug. I’m cleaning up some of my recipes pages, dear reader and splitting off the ones that have become too crowded. If possible I’ll update these with photos in the future, but for now this will have to do. I’ll schedule these so they won’t overrun the site. 1. Heat Olive Oil in a pot on a medium heat. Then add the Garlic and Onion and cook for 5 minutes or until soft. 2. Stir in Rice and cook for 2-4 minutes, stirring occasionally to prevent sticking. Rice should be slightly translucent and may brown slightly. Add Rooibos, Salt, Black Pepper and Parsley and stir up the Rice, and bring to the boil, then turn the heat down to medium (3 on hob) cover and let it cook for about 12 minutes. 3. After the 12 minutes is up, remove it from the heat. Let it stand for another 10 minutes or so. After 10 minutes, lift the lid and take a fork and fluff the Rice. 1. Steep the Teabag and Sultanas in boiling Water or 5-10 minutes depending on desired strength. 2. Add the Olive Oil and Curry Powder to the pot and cook for 1 minute on a low heat. 3. Add the Tea (Topping up to 250ml as necessary) and Sultanas and Rice the pot. Stir it together and turn the heat to high. Wait until the water boils and starts bubbling then turn the heat down to medium (3 on hob) cover and let it just sit there for 20 minutes. 3. After the 20 minutes is up, turn off the heat. Let it stand for another 10 minutes or so. After 10 minutes, lift the lid, add the Salt and then take a fork and fluff the Rice. You’ve caught me, dear reader, I’m updating this on the Q.T. I’ll reblog it nearer the season, there are enough people bring the festivities out too soon already so I won’t add to the misery, or mayhem. The fun? Don’t be silly. Same idea, probably not a huge number of recipes to add. But there are still all the originals to choose from so it’ll all turn out good in the end. Same as before, a bit of fun and recipes collect by similarity. You ain’t seen me, right? I’m running out of title gags, cut me some slack, dear reader. Now though I’ve mentioned a few vegetable sides I’d be remiss to neglect the duo of Roast Cauliflower and Roast Broccoli. Now, prepping vegetables can be a pain. Here’s where this comes in so handy: You can blanch and freeze your own vegetables. Both these work well from frozen and all you need do is drizzle some oil, season and roast. Simple, a crispy crunchy side. Speaking of crispy, perhaps better as a snack, but I’m never fussy when it comes to crunch. We have Roasted Julienned Sweet Potatoes. With nightshade intolerance a lot of vegetables, especially the ones I love, are forever out of my scope of eatables, but as you can see there are a variety of options when it comes to vegetables. Even the ones you might not like become better when roasted. Serve your caviar on pigweed crackers! You, dearest reader, might be playing host. Sometimes the simple things are best. There are two options for crackers, Buckwheat and Amaranth. For canopies if you’re posh, or have delusions of grandeur or if you’re common as your pal, then for smearing cream-cheese on. If you’re really lazy just make the tortillas instead of baking them and pile everything on, I won’t judge. They both cover a lot of diets so that a bonus. On the other hand say you’re playing guest, you could pack up some Honeycomb, Brittle, Fancy Brittle What? It’s French. Therefore it’s fancy. Oh! And Sesame Seed Brittle for the nut-free. I imagine home-made candy makes a great gift, I saw it on TV once. Naturally most baked goods make great gifts. It’s just that candy feels special. This nightshade free stuffing is worth getting the ingredients. What are the odds of you having harlequin squash to hand, probably not good, but hope springs eternal and as far as potato replacements go it’s the best I’ve found. So for nightshade free roast potatoes we have Faux ones made with Harlequin squash. Not to be outdone I also have Stuffing for you, a traditional family recipe. You can’t beat a simple sage and sausage stuffing. You might be lucky enough to have fresh sage still growing. Even if you just sauté them, harlequin squashes are a wonderful side and delicious all year round. With or without pastry lemon curd and meringue is a match made in heaven. I don’t know how traditional a Lemon Meringue Tart is, but in our house it was mandatory. You’ll need to assemble it from other recipes, three to be precise, but it isn’t as daunting as it sounds. You’ll want your Pastry, use the chia egg for easy rolling out, then make some Lemon Curd, with an option to just use the egg yolks so you can save the whites for your Meringue Topping. You could make little Meringues if you’d rather, maybe as little snowmen or women. At any holiday that involves food you’ll find everything is fair game, so why don’t I go all out go all out and mention this Strawberry Mousse. If you’ve stumbled across this page then you might want to pop back nearer the holidays as it might see some more additions. I’m not big on holidays, which is a very polite way of saying I have on occasion abhorred them. I’m getting better at indifference. This is just a little help for those who do love them, but struggle when looking for suitable recipes. I like to think it will help someone out there. Now I’ll be the first to admit that I’m not big on the holidays, but I realise that there are plenty of people out there who love this time of year, so rather than being a Scrooge, or a Grinch, I’ll instead be compiling a list of my recipes that could be said to fit into the festive theme. They really just fall into desserts and sides, but I’ll try to lump them together in a slightly more fun and creative way. All recipes will be hyper-linked so just follow them to their respective pages. This is going to be more of a pain thanks to WordPress changing the way links work, but I’ll persevere, for the children, the poor little babbies! *Picks up baby* Look at it…poor little guy *Tosses it over shoulder* So, this list is just my meagre contribution. I will say one thing, lord knows you can’t shut me up even if you try, do remember that it’s just one day, it’s not the end all and be all of everything, if you can’t eat all you want then it’s no big deal and remember waiting until New Year to start the journey to a “new” you is useless if you precede it with a huge binge. I started when I first thought of it, I didn’t wait for a specific date and it’s worked for me. If you start anything start at that very moment of decision and steel your resolve. I’m just being pre-emptively cranky, tis the season, but really, I hope this helps make the season more fun/a little easier. Onwards an upwards! To the recipes. Keep an eye on this throughout the month, I may have more recipes to add as time rolls on. Roll-out Biscuits that hold their shape. An original recipe made especially for this time of year. For the young and the young at heart. Check out the page for details. I may look into these again soon, a really enjoyable recipe. Okay, back again with a new recipe. Another gingerbread cookies, this time a Buckwheat one. Hit the page up for the full recipe. I used half an egg rather than a flax egg because I feel you need the rise an egg provides. You can do half or just follow the recipe for a full 22 cookies, it can vary depending on the sugar, but only by a cookie or two. I was going to try these with treacle as it goes really well with the spice blend, but I’d be weary on the stability, thankfully dark muscovado sugar gives them enough of that treacly taste to compliment the warming spices of the blend. A crunchy exterior and fluffy interior make for a lovely cookie. A few lines of simple icing would finish these off a treat. Sautéed Sweet Potato with Butternut Squash Gravy. Go nightshade free and you’ll hear nothing but sweet potatoes. I honestly hated them at first, but I’ve grown to love them. Sadly it’s a love kept in check by moderation, they don’t love me quite as much. Sweet potatoes make a handy side dish so you can have them a few different ways. Sautéed Sweet Potato with SP Seasoning (Two ways) is time consuming, but not as daunting as it sounds. Squash works here too, maybe try both for a real variety of flavour. How about Muffins? Sure it’s an unusual choice, they’re better with a blob of butter, but nothing says you have to have them as a dessert. They’re on the Buckwheat Muffin Page. If all else a nice SP Mash can’t be a bad option either. The muffin and Mash cane be prepared ahead of time and frozen. I’ll be mentioning what can be frozen as it really helps to plan ahead. My nightshade intolerance is showing up a lot, huh? I have no idea how common it is, but it’s plagued me all my life. At times where potato dishes are ubiquitous it becomes a real pain, but mash isn’t out of the question! You could opt for a Chickpea Mash, which really makes a great substitute for potato. Butternut makes a lovely mash, a dash of salt and pepper and you’re all set, a better variety for a potato like experience is a Harlequin squash, but a butternut will be just as good. Now onto the odder side of things it’s: Cashew Butter Amaranth! Thick and delicious, it’s a shame I can’t get it here any more. Even plain, or maybe stock cooked, amaranth would make a great side. Quinoa is a nice option too. Remember you can use anything here in conjunction with another recipe, mix it all up and see what you can create. The butternut would be the best for freezing, the chickpeas are a maybe, but I never tried them. Quinoa can be frozen and reheated. Do remember to check out the respective pages to see what allergies are accounted for, a lot of recipes have a lot of accommodating options. Just two this time the ever wonderful Cashew Butter Gravy and the Nut Free Butternut Squash Gravy. The cashew gravy was born from a mistake and was made a few Christmases ago. As far as freezing goes I’d say you should try making them fresh, but they both should be freezable, the BNS suffers a bit in the colour department after freezing. Remember you can use any stock you like so they can be vegan as well. For my best pastry yet check here. You know my Buckwheat Flour Pastry, best with a chia egg. Imagine the possibilities here, a Curd, maybe an easier version of my Bakewell from last year, fill them with gluten free mincemeat and you’re set. Maybe individual Cheesecakes, no bake. I don’t recall ever having tried freezing the pastry, I imagine it could work, but you’d be best to test it out first with something small. It’s worked so easily and can be rolled so thin it’s really versatile, I imagine baking for a large crowd would open up a lot of options. You have to love Gingerbread, whether it be in Cookies, or Muffins, as a separate Blend, for hot drinks, baking or maybe just as a gift, a decadent Loaf, whatever you decide it’s important to remember you’re not limited to these recipes, take the spice blend and run wild. All but the cookies can be frozen in advance. I love the blend when combined with treacle and muscovado sugar. A decorative cake tin might really make the loaf stand out, a little frosting or just a dusting of icing sugar and you’d have a great centre piece. If you’re having guests, or you’d just like a cheeky slice of something sweet try my Flourless Nut Cake, they’re a bit of work in the preparation, but worth every second. They present lovely, but only keep a few days so eat up. 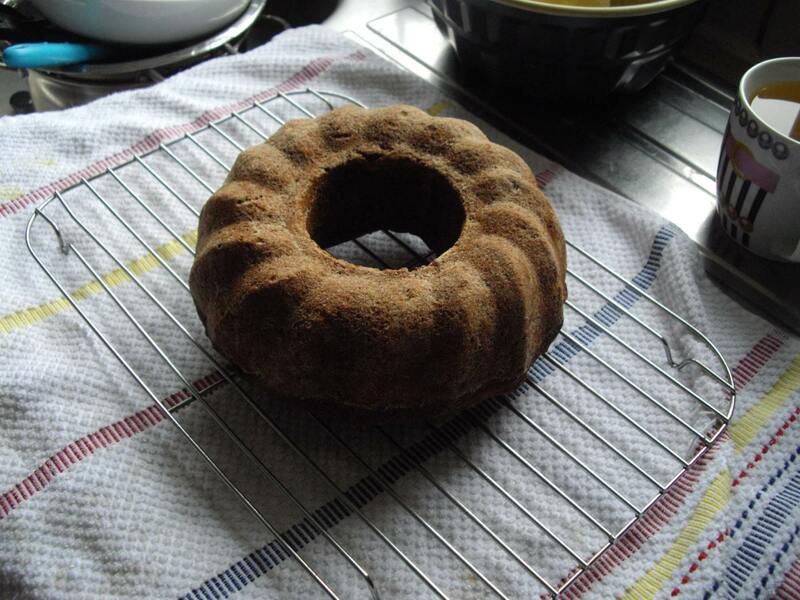 For a freezable option, no one need know, try my Treacle and Tea Bread or perhaps a Fruit Loaf, a slightly more traditional option, but much faster to prepare. Thankfully the latter two are pretty low in sugar so you can have quite a bit without worrying over-much. Lastly we have some Rice Stuffing and Mixed Spice, the stuffing freezes well, it’s best enjoyed in small portions as it is very strong. The spice blend is a common one, but add it to cakes and loafs for a festive kick. So that’s it from me. I’ll add any new recipes that pop up so do check back over time. You could do anything you like from my hundreds of recipes I just thought I’d put together a few that really fit in with the season. As for me it’d be a quick dinner and maybe a dessert, this is the day I take a lazy day. It’s a 365 job, no eating out and no breaks so I don’t make a big fuss over this day. I’ll just make a curry, double it, freeze it and have it Christmas day and have a cold turkey dinner the next day. Like I say it’s just one day, but if you are making a celebration of it I hope this list helped somewhat. Take care. With a slightly crisp exterior and a soft yielding interior this loaf ain’t bad. My buckwheat bread recipes has really helped me create some amazing recipes. It’s so versatile and so healthy to boot. No need for a load of sugar or butter here, just a simple celebration of the natural sweetness of honeybush tea and fruit. I gave a slice of this to a non-celiac and they loved it. That’s always the measure of a good recipe in my estimation. I’m honestly shocked how well it came out. I assumed it’d either be mushy inside of it’d just fall apart from the fruit. Thankfully the ever useful flaxseed meal comes to the rescue and keep everything in place. I managed to get some soft dried fruit, it’s surprisingly hard to basic ingredients around here. There aren’t any tricks here. Rice flour helped it pop right out without any hassle or sticking. The melted butter guaranteed that there were no patches left ungreased. The apricots and dates were the ready to eat variety, so there was no need to soak them. Usually soaking the fruit provides all the moisture needed, but because of the flax and soft fruit I was able to add more tea and control the texture of the loaf, I say loaf since it’s not as sweet nor as delicately soft as a cake would be. I washed the glacé cherries to take off the sugary syrup. Flouring the fruit helped to stop it sinking, like I say no real tricks just some basic knowledge and experience. I didn’t want a massive mess so I just filled it to halfway. I really wasn’t sure it’d work. It bakes the same as usual. You could even take this further with the zest of any citrus, a dribble-over icing and some cherries to top it off, or maybe a dusting of icing sugar. The sky’s the limit as far as decoration goes, I would say that you should stick to the 250g of fruit, I also think the mixture of soft and dry helped keep the cake stable. Though I like the difference in texture between the fruit, the sweetness varies between them too, so each bite is a little different from another. I had no hope of it coming out clean, but it did! I did wipe off the excess rice flour. So, here we are. 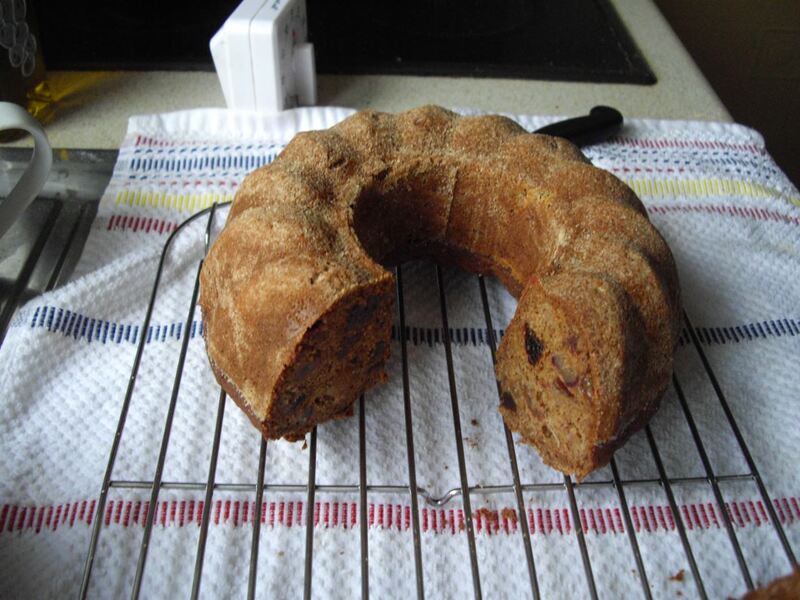 A really healthy fruit loaf, all natural sugars from the fruit, a little extra for sweetness too, and all the good of dried fruit, the little bit of Mixed Spice is a nice addition, of course Buckwheat flour and flax are heavy hitters in the nutrition department. All things in moderation naturally, but when it comes to something like this a little extra will do you more good than bad. I hope you will try this out, remember you can substitute a lot of things in this recipe, if you like you could even change the flour for a wheat one and you wouldn’t be far different in texture, or so I’m told, just lessen the liquid. Until next time, take care. For only half the tin it looks really nice. Impulse buy pays dividends. 1. Add the Teabags to the Water and stew until a strong Tea has been brewed. Remove Teabags and add Sultanas and Raisins. Cover when cool and leave in fridge overnight. 1. Preheat oven to 175c (No Fan). 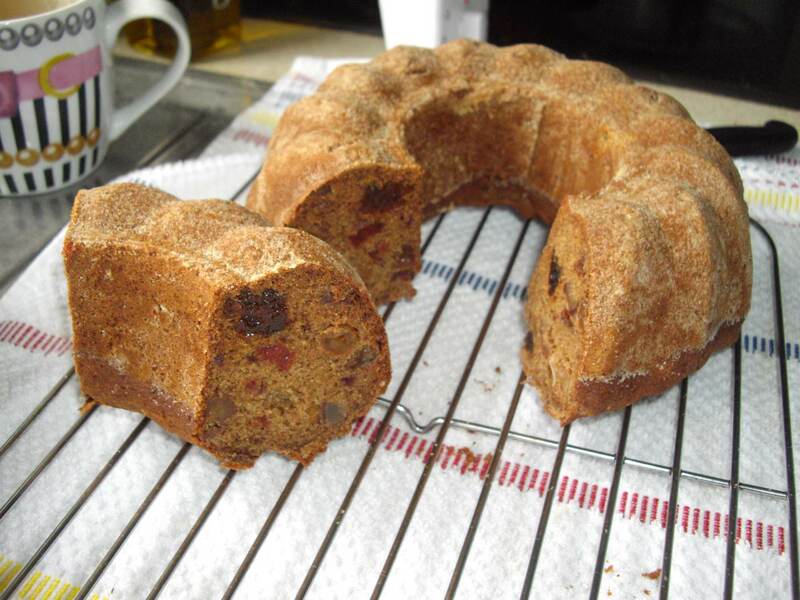 Brush a Bundt tin with melted Butter and dust with Brown Rice Flour or grease and line a 6×3 inch loaf pan. 2. Drain the Soaked Fruit and reserve the Tea. Add the other Fruit to the soaked Fruit and toss with 1 Tbsp of Buckwheat Flour. 3. In a large bowl mix together the Egg, Olive Oil, Mixed Spice and Sugar until well combined. Add the Buckwheat Flour, Flaxseed and Baking Soda and stir until combined, then add the Fruit and Stir together. Finally add the reserved Tea, a bit at a time, until a thick but stirrable Batter has been formed. 4. Pour batter into prepared tin, wet a spoon with the remaining tea and smooth down the top, then bake for 40 minutes, turning halfway if needed, until golden brown and a skewer comes out clean. Let cook in tin for 15 minutes then remove to a wire-rack. Cut hot out of the oven with no crumbling. I had no chopped peanuts, but a Peanut Curry works well too! A quick and tasty update today. Just another variation on my Wholegrain Basmati. Just roll down the page and you’ll find it. This will work with any cooked rice. Although for the twist you’ll need to cook it fresh. I decided to try cooking the rice in some Honeybush tea, which is, if you’re not already aware, a variety of rooibos: My tea, or tissane, of choice. It worked well, the honeybush gave it a nice background flavour and the main pour-over gave it a sweet, warmth that works wonderfully with the peanut curry. You could even cook the rice with peanut butter and then add the mix. Without nuts will be fine too. I’d like to say a quick word on honeybush. There are quite a few members of the rooibos (Pronounced roy boss, or so I’m told) family, I’ve used wild, green and red before and although I’ve drunk it before, I haven’t had any access to honeybush in a long time. That’s now changed, so you can expect to see a few recipes using it in the coming posts. This is a tea made for desserts. The fragrant perfume, aroma doesn’t do it justice, and the naturally sweet taste are a match made in heaven for sweet treats. Not to say you couldn’t use it in other ways, in a syrup (Akin to the Espresso one) or in Smoothies instead of water and of course a Tea Bread will be incoming. I have a bundt tin to try (Hope it works!) and some dried dates and apricots too. When I get my hands on ingredients you know I’ll make full use of them. Until later! I…don’t remember writing all that. I was engrossed in a murder mystery visual novel so maybe that’s taking precedence in my memory. I just feel like typing blah blah blah over and over, a decidedly lazy day, but fear not dear staunch support of this humble blog I would never do that to you! (Not unless I could get away with it). I’ll delay this post to spread it all out a bit. This can also be found, amongst other recipes on the Wholegrain Basmati Page, which has a lot of recipes I’d forgotten I’ve have. This brain can only hold so much, like the fact that the baby was the murderer! (It wasn’t, really a shame). So, what is Green Rooibos? It’s a tisane, ummm, it’s prepared like green tea, but, oh just Google it. All I know is it tastes better than green tea did to me, none of the weediness, just a light refreshing version of rooibos. My tea, or tisane, of choice. I contacted a company about the presence of gluten and was helpfully informed all their tea are gluten free, so I popped down to the shops and am, once again, enjoying a cup of “Green Red Tea”. The rice holds some of the taste of the tea, but there’s more of a salty sweet note due to the fruit and salt. I’m not sure how the Original holds up, but this was rather pleasant and one I’ll return to again. If anyone has tried a lot of green tea, I had one cup once, certainly no expert, then perhaps you’ll also try green rooibos and see how they compare. That’s it for a few. See you soon. My Almond Curry has a new option too. Adding the Garam Masala at the end for a flavour boost.